this mod added 1 set of heavy and light armor. this one that recently got deleted on nexus. you can craft it under leather and steel category. Hi, the file says needs a password? Is this female only? I'd really love this for male. i love this armor. but why my female character boots kinda mess up. im using cbbe. Hello, I love this armour, but there is a black diamond in the middle of the screen. :( I thought there was a fix but I can not find it now. I Love this armor, thank you. 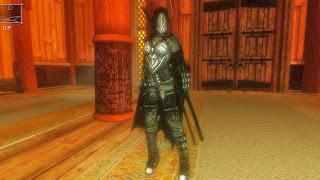 I love the look of this armor but the sendspace link isn't allowing downloads is there another place to get this armor? What character? There 2 screenshot there mine and maymay1588 shot. You were the one who originally uploaded this to the nexus? can anybody tell me what idle animation he is using in that picture? I found the fix: put fNear1stPersonDistance=5.00000 under [Display] in skyrim.ini file. Try adjusting the value, when I set it to 0, maybe 10% of my screen was black; when I set it to 6, the black triangle only appears briefly when sheathing my weapon. At all other times, it does not show. Now the armor is perfect. TVM!! I used 5.4700, because I have a 1900 screen. Hi your armors are fantastic! I am searching for the long cape version that you did, it was a really cool cape would you mind re-posting the file? "The Black Swords man armor"
Also I had your Vie long cape mod but when I added them to the mod list they turned purple, is there a way to fix this? For those of you experiencing the floating black diamond bug in first person view, use Mod Organizer to open your skyrim.ini file (jigsaw icon, ini editor) and then put fNear1stPersonDistance=5.00000 under Display heading. I use a value of 6. If you don't use MO, just open the skyrim.ini file manually. This fixed the issue completely on my skyrim build. Does anyone have a fix for the black diamond that keeps appearing when the player in in first person mode? I tried the fNear1stPersonDistance but that didn't do anything for me while I tired many different values. Any other suggestion? This armor is awesome! I started wearing the mask with a maskless version of Konahrik's hood, and I'm telling you, it looks almost perfect! Vie, is there any way to convince you to make a mask that's as long as the helmet's faceplate? Not sure if you're even working on this stuff anymore, but figured I'd give it a shot! Thanks for your hard work in any event! While I'm guessing you don't read this anymore I'm curious to see if you do, I've been a fan of your work for sometime however since you were banned and most of it wa taken down I was wondering do you still have the old files? specifically the Long Cape and black swordsman outfit. I understand if you never get around to reading this, getting banned was probably a huge deterrence to modding and I'm sorry it happened your work was awesome and I doubt we will see something like it again. how to install it? why i cant install with nmm? could you tell me how to install with manually ? Just copy contents in to Skyrim/Data folder. Great Mod! Loved the Infinity Blade games and played each of them all the way through! I only have one slight issue with this armour though, in first person some of what I think is the armour clips onto my screen, when I hold a torch or draw a melee weapon it goes away, when I use Magic, depending on where I'm looking, it can get really buggy, and sometimes when using a bow it'll get really buggy, any idea on how to fix this? This is my favourite armour mod and I really don't want to have to stop using it or only use third person. This armor looks very beautiful, but for some reason, my mod manager isn't activating it. It keeps saying the file is corrupted. Any ideas? 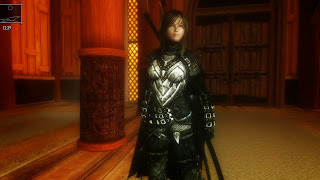 I really want this armor mod. I know im late but you should really reupload this at somepoint. Going on random websites and downloading something isn't something I plan on doing.